Nadine Corrigan: As I was going to St. Ives, / I met a man with seven wives. / Every wife had seven sacks, / Every sack had seven cats, / Every cat had seven kittens. / Kittens, cats, sacks, wives, / How many were going to St. Ives? First time director Ray Milland must have scored a success with this psychological Western typical of the 1950s, as he went on to both direct and star in four more features- 1956's "Lisbon," 1958's "The Safecracker," 1962's "Panic in Year Zero!" and 1967's "Hostile Witness." In the role of Wesley Steele, a gunman of ill repute, having to kill simply to survive, director Milland begins the film with nearly a half hour without (much) dialogue. Steele discovers a massacred stagecoach, five people shot dead (including a little girl), all the money gone. 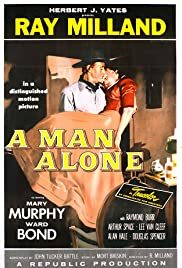 He soon finds himself in a most unfriendly town, where the hapless deputy (Alan Hale Jr.) prefers to shoot first and ask questions later; incredibly, the safest place for Steele to hide from a possible lynching turns out to be the Sheriff's quarantined home, due to his being bedridden with yellow fever. Lovely Mary Murphy, Marlon Brando's leading lady in "The Wild One," is entrusted with the most difficult role, the Sheriff's daughter, who naturally falls for the much older Steele, and capably manages the feat of growing up from 'daddy's little girl' to feisty heroine, inspiring Wes to return to clear his name, and redeeming her own father (Ward Bond), who had fallen under the crooked influence of town banker and criminal mastermind Raymond Burr. You can't go wrong with a supporting cast that includes Lee Van Cleef, Douglas Spencer, Thomas Browne Henry, and Arthur Space. Unfortunately for Mary Murphy, her screen career wound down all too quickly, though television kept her busy for another two decades. Horror/sci fi buffs remember her turns in 1951's "When Worlds Collide," 1954's "The Mad Magician," and 1957's "The Electronic Monster."